Mi primer cajita de acuarelas fue un regalo de jorge Royan. El me convenció de las bondades del uso de acuarelas y no tarde mucho en comenzar a usarlas, aunque en mi vida las habia tocado (supongo que en el colegio primario, pero eso fue hace mucho tiempo ya). La caja está hecha de un contenedor de tarjetas personales de plástico, con goma eva calada y fondo de alto impacto. Son 8 colores Rembrandt: Madder Brown, San Green, Prussian Blue, Cad Yellow, Indigo, Payne´s Gray, Sepia, Burnt Umber, Quinacridone Gold y Dioxazine Violet que use muchas veces, sobre todo para ir probando los consejos que me daba jorge. Un buen tiempo despues compre una cajita de Cotman Windsor & Newton de 1/2 godets de 12 colores: Lemon Yellow Hue, Cad Yellow Hue, Cad Red Pale Hue, Alizarin Crimson Hue, Intense Blue (Phthalo Blue), Ultramarine, Sap Green, Viridian Hue, Yellow Ochre, Burnt Sienna, Burnt Umber y Chinese White. Luego busqué algunos colores más en pomo, que para incorporarlos a mi caja, dividí algunos espacios para alojar 2 colores: Ivory Black, Payne´s Gray, Raw Umber y Cad Red Deep Hue. En Septiembre de 2013 me hice una nueva mini cajita de chapa de un envase de chicles que me regaló mi hija. En esta puse colores de los pomos Cotman y recliclé los de Rembrandt de la caja de Jorge. Esta cajita la llevo a todos lados, es muy chica y cómoda. El único punto molesto es que la tapa es cóncava y solo permite usar un solo color a la vez. Como pinceles tengo todos con reserva de agua. 3 de Kuretake, fino, medio y grueso, y un cuarto que me regaló mi mamá, que es intermedio entre el fino y el medio de kuretake. Completan el set una botellita de agua de plástico para recarga de agua de los pinceles y toallitas de papel para ir limpiando los pinceles. También suelo usar un platito de chapa chico para mezclar los colores ahí, pero no los uso con frecuencia. My first box of watercolours was a present from Jorge Royan. He convinced me of the benefits of using watercolors and not take long to start using them, although never had touched it in my life (I guess in primary school, but that was a long time already). The case is made of a transparent plastic container of personal cards with holey rubber and a dense plastic in the bottom. There are 8 Rembrandt colours: Madder Brown, San Green, Prussian Blue, Cad Yellow, Indigo, Payne´s Gray, Sepia, Burnt Umber, Quinacridone Gold and Dioxazine Violet that I used it many times, specially to put in practice Jorge´s tips. A while after, I bought a pocket Cotman Windsor & Newton watercolours set of 12 half godet`s colours: Lemon Yellow Hue, Cad Yellow Hue, Cad Red Pale Hue, Alizarin Crimson Hue, Intense Blue (Phthalo Blue), Ultramarine, Sap Green, Viridian Hue, Yellow Ochre, Burnt Sienna, Burnt Umber and Chinese White, and completed with some tubes to add it to the box. I divided some spaces to fit two colours in each: Ivory Black, Payne´s Gray, Raw Umber and Cad Red Deep Hue. 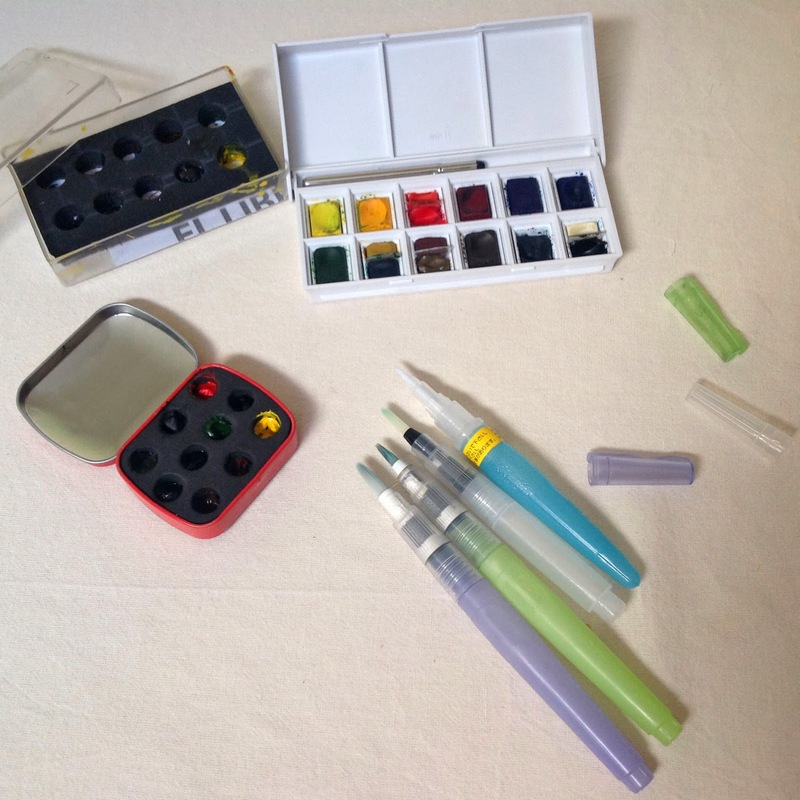 In september 2013 I made a mini-watercolours box from a gum package (present from my daughter). Here I fit some Cotman and Rembrandt tubes. I take this box everywhere, it`s very practical and tiny. The downside is that the lid is concave, so 1 colour at a time can be used. I use H2O brushes, 3 Kuretake fine, med and broad, and another that`s between fine and med of the Kuretake. The set is completed by a plastic water bottle to refill the brushes and tissue`s to clean the brushes. Also I take 2 small dishes to prepare colours, but I used it eventually.